Structure and regenerative capacity of synovial joint tissues; The myofibroblast in connective tissue repair and regeneration. Part 1 Cartilage repair and regeneration: Structure of articular cartilage; Measuring the biomechanical properties of cartilage cells; Understanding tissue response to cartilage injury; Understanding osteoarthritis and other cartilage diseases; Using animal models of cartilage repair to screen new clinical techniques; Cartilage tissue repair: Autologous osteochondral mosaicplasty; Cartilage tissue repair: Autologous chondrocyte implantation; Cell sheet technologies for cartilage repair; Cell therapies for articular cartilage repair: Chondrocytes and mesenchymal stem cells; Scaffolds for musculoskeletal tissue engineering; Outcome measures of articular cartilage repair. Part 2 Repair of tendons and ligaments: The structure of tendons and ligaments; Tendon biomechanics; Tendon injury and repair mechanisms; Tissue engineering for ligament and tendon repair; Cell-based therapies for the repair and regeneration of tendons and ligaments; Scaffolds for tendon and ligament tissue engineering. Regenerative medicine for the repair of connective tissues is a fast moving field which generates a lot of interest. Unfortunately the biomaterials and biomechanics for soft tissue repair has been under-represented in the past. Particularly the natural association between cartilage, tendons and ligaments is often not made. 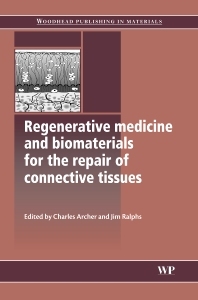 Regenerative medicine and biomaterials for the repair of connective tissues addresses this gap in the market by bringing together the natural association of cartilage, tendons and ligaments to provide a review of the different structures, biomechanics and, more importantly, provide a clear discussion of practical techniques and biomaterials which may be used to repair the connective tissues. Part one discusses cartilage repair and regeneration with chapters on such topics as structure, biomechanics and repair of cartilage. Chapters in Part two focus on the repair of tendons on ligaments with particular techniques including cell-based therapies for the repair and regeneration of tendons and ligaments and scaffolds for tendon and ligament tissue engineering. Dr Charles Archer is Professor of Reparative biology and tissue engineering at Cardiff University, UK. Dr Jim Ralphs works at Cardiff University and is highly regarded for his research on connective tissues.